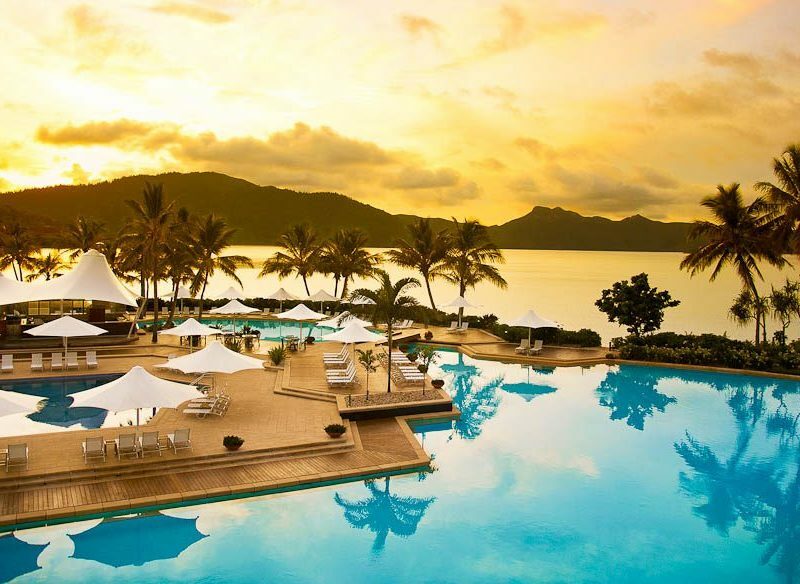 From dawn to dusk, Hayman blends nature and comfort. 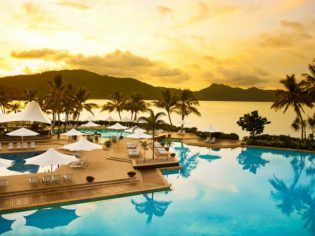 You might say that a main pillar of a luxury holiday involves having the freedom to do whatever you want, but on Hayman Island, that is not quite the case. Admittedly, the staff here will go to almost any length to make sure you’re satisfied with island proceedings – private butlers, personalised hand-made chocolates, ‘room’ service delivered to any location on the (wild, untamed) island – but in every suite of the resort there is a small card, which comes with a request: please, keep your windows and doors closed when not in-room. Otherwise, the sign explains, you might find yourself with a panicked bird in your suite. But Hayman insiders know better. For although birds may find themselves accidentally indoors on the odd occasion – and there are dozens of species to be found on the island, from kookaburras to graceful white swans – there is also one specimen of bird who has decided that visits indoors are actually quite a rewarding experience. The cockatoo, a decidedly confident creature, has been the subject of several reports over the years from guests who have returned to their rooms to discover a yellow-crested intruder in their space. And why? Because they have developed a taste for the excellent vodka on offer in the mini bar and have thought themselves to raid it. (Indeed, they have even learnt how to unscrew lids.) It would seem even the birds here have a taste for the finer things in life. But such is the beauty of Hayman Island. The resort here is as luxurious as you could want, attracting everyone from Tony Blair and Rupert Murdoch to Elton John and Mariah Carey, but the island itself remains firmly a construct of nature. Positioned at the top of the Whitsundays – it is the northern-most island of all 74 – and home not only to one of Australia’s most awarded luxury stays, but to a thriving natural ecosystem including swarms of butterflies, migratory dolphins and whales, turtles, swamp hens and as is befitting of an island off the Great Barrier Reef, a stunning underwater world. The property is self-described as a ‘luxury nature-resort’, a variation of the theme it has been offering since first opening as a fishing retreat in the 1930s, and it is an effective summation of the island experience. There are 209 rooms – although upcoming renovations will see this scale back to 160 – but privacy is easy to maintain, much of which can be attributed to some remarkable landscaping. The gardens, created by Jamie Durie (who rebuilt them post-Cyclone Yasi), are a well-behaved jungle of lush ferns and tall, tropical palms; providing much in the way of creating the sense that this is a hidden place; enclosed well away from the demands of regular life. And that is the real luxury of Hayman. Resorts can pop up almost anywhere; filled with accommodating staff and excellent food, but it is impossible to replicate nature’s magic in a location. Like the rest of the Whitsundays, which remain almost entirely untouched (only seven of 74 islands have undergone development), it is the sparkling waters, the scrubby gum trees and the velvet green of the hills of this place that are its most endearing features. No doubt it was these attributes that attracted international conglomerate One&Only – who have a portfolio of high-end properties including Dubai’s One&Only The Palm and the Ocean Club in The Bahamas – to the island. They have just announced that Hayman will undergo $40 million worth of renovations over the next few months, before re-launching as One&Only Hayman Island in April next year, complete with a beauty salon, upgraded gym, a new adults-only pool and lounge, and a One&Only health spa. But the resort will retain its personality, Hayman spokesperson Anna Guilan is quick to stress – “none of [Hayman’s unique attributes] will change. One&Only will provide global expertise and ensure that we are well-positioned on the global stage for future.” The cockatoos, no doubt, will be glad to hear it. From Whitsunday Coast Airport (just outside Proserpine) you’ll need to take a taxi or shuttle to Airlie Beach. From there, Hayman is a 55-minute boat ride away, costing $210 per adult. Alternatively, you can take the launch directly from Hamilton Island’s Great Barrier Reef Airport. The cost is $290 per adult. The boat ride includes soft drinks, alcohol and light refreshments on the way there and drinks on return. Pack seasick tablets just in case, it can get rough. Or for something special, why not charter a seaplane from Hamilton Island. The 15-minute one-way transfer costs $790 for the six-seater, or $1590 for the 10-seater. Helicopter transfers are also available – enquire with Hayman Island Resort directly. Room rates start from $590 a night for a one bedroom pool room, including breakfast and on-island activities. ‘Festive’ room rates (21 December – 5 January) are higher, from $649 a night. – Request a fresh coconut (or three!) ahead of your arrival. They’re not on any menus, but the island’s 1500 palm trees are denutted each fortnight, producing around 800 coconuts which, if not drunk, are simply put on the mulch pile. – Join a complimentary nature walk with Hayman groundskeeper Doug, if one is running. He does them purely for enjoyment, and after eight years on the island he’s full of information about its wildlife and bush. – Take a hike along one of Hayman’s walking trails. The entire island is accessible to guests, and the lookouts are beautiful.